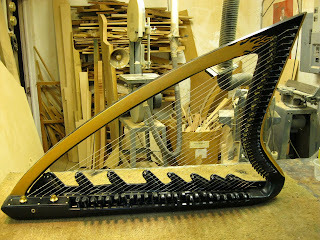 I just completed a 32 steel stung electric Double action Pitch Bend harp, for a client in Holland. 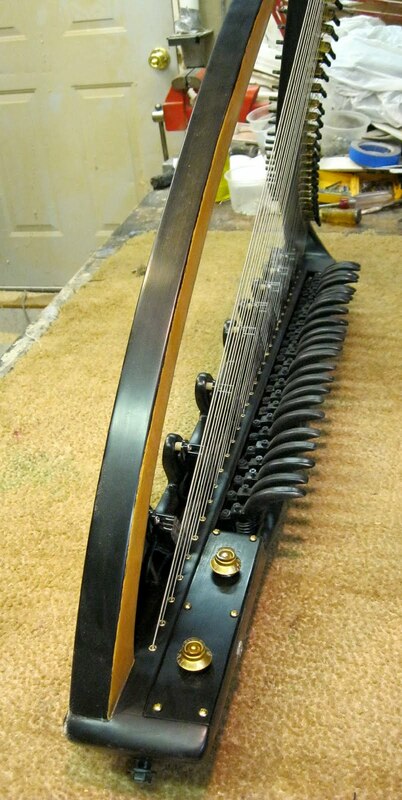 It has 24 strings with spring loaded pitch bend levers on the bottom ends of those strings. Eight of the strings are just normal electric strings. The strings are all electric guitar and electric bass strings. there are 8 Seymour Duncan humbucker pickups on an adjustable support bar just above the sound box. It is harness mounted and will be used with a cordless sound system to play blues and jazz. The owner will debut with it at the World Harp congress in Vancouver BC, in late July. The finish is flat low gloss balance, with carved and painted gold Harley Davidson flames on both sides of the pillar. That looks REALLY cool!!! Can you post a sound sample online at some point? I just translated your post to this in English : "very interesting. I'm harpist, live in mexico and want to buy a harp electric with midi system, I am very interested in this model (which bought its Dutch client) is possible? how much does it cost? I'm going to go to the State of California in September, they have a store or distributor in that State? Thank you"
I will reply in English. This specific harp is a custom experimental harp with the pitch bend levers. It is electric, with the steel strings and magnetic pickups. I do also build midi harps. 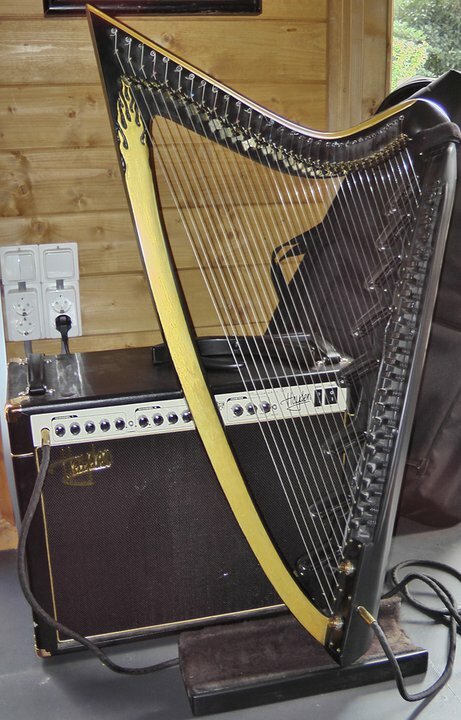 This harp is not midi equipped. You can go to my website, www.mountainglenharps.com, to see the information on my midi harps. Click on the electric harp page for that info. the prices have actually just gone up, due to the cost of having the midi board made, Just email me for the current price information. 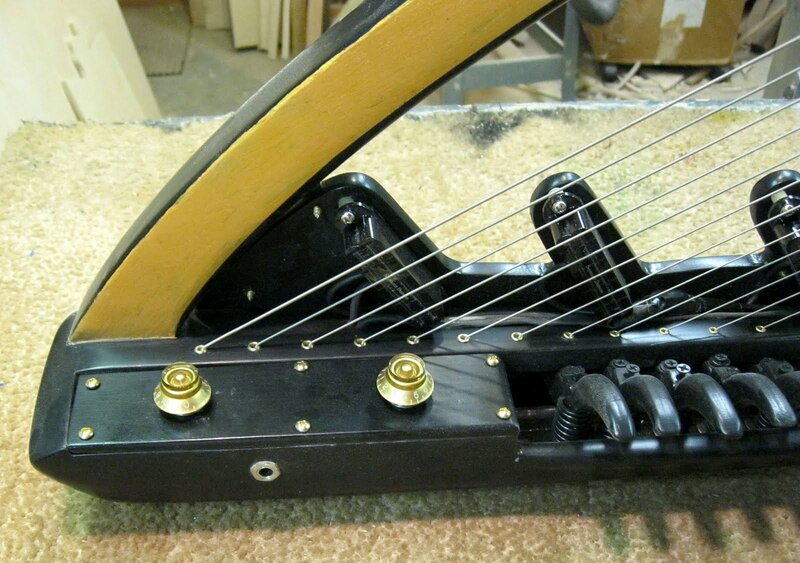 I do not sell my harps in stores, as all of them are custom design ed built, one at a time.